How To Merge Cells in a Column? 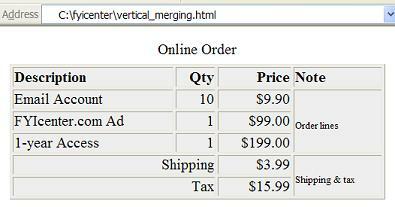 If you want to merge multiple cells vertically in a row, you need to use the "rowspan" attribute of in a "td" element. "rowspan" allows you to specify how many cells you want to merge into this cell vertically. What Is a "table" Tag/Element? What Is a "tr" Tag/Element? What Is a "td" Tag/Element? What Are the Attributes of a "table" Element? How To Create Table Borders? How To Turn On Some Parts of Table Outer Borders? How To Control White Spaces between Table Cells? How To Control Padding Spaces within a Table Cell? How To Control Table Widths? What Happens If One Row Has Missing Columns? How To Control Horizontal Alignment in Table Cells? How To Add Column Headers to a Table? What Is a "caption" Tag/Element? How To Merge Cells in a Row? How To Create Nested Tables?